My friend bought this table for me for $3.oo at a garage sale. That was a bargain! I can't wait to cottage it up! I painted that hutch behind it black years ago before I got into the cottage style. I guess I will repaint it one day. That will be a job! Covering all of that black! 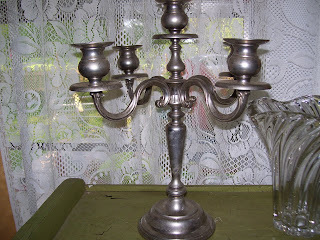 I bought this beautiful candelabra for $2.00 at another sale. It is so heavy. I know that I will be painting it too. 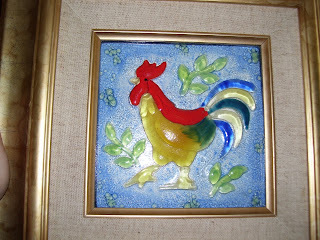 I bought 2 of these rooster pictures for $1.00 each. They are made of glass! I love them! They are just alike. On the way home from Garrett's play the other night, we passed a dealership with this old car parked out front and I almost flipped! Isn't it beautiful? I just got out to look at it and the door was unlocked so I thought...I want to show my blogging friends! The dealership was closed! I guess that I could have gotten in trouble! Oh well...I could have explained! lol That is my friend's little girl with me...Hailey. I need this car! Why can't I ever find something like this at a garage sale? I wonder if it drinks a lot of gas? HMMMM...that would take away from my thrifting money! Oh no! Of course, I would have to paint pink roses on it! Wouldn't that be sweet? Maybe one day. Maybe it's not a dream. Hope y'all liked my garage sale finds. 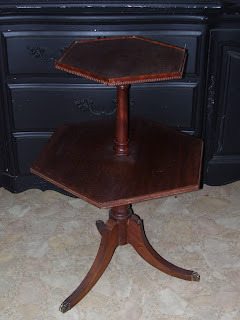 What great bargains AND finds, Lee L. That table was a STEAL & I am dying to see it when done. Love that car, was it a good buy?! Darling pics, as always. What great finds! I have a table like that which I'm planning on applying mosaics on it. We should show & tell once we're done. I'm a thrift addict myself. I would hate to be on Clean Sweep. I don't think I could bear tossing my beautiful finds. And the car! You forgot to put on your Pink Ladies jacket! Nevertheless, the cart fits you!! 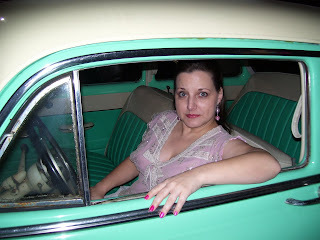 I love old cars especially from the 1910-1920s. One day, I'll own one. One day. From one thrifting buddy to another! Hi LL. LOVE that car. My hubs.. oh he'd be over the moon for it. Your table, are you going to a cottage look all through your home?? What colors are you doing? I've been a painting fool for two weeks. I'm about to reveal my armoire on my blog later. I love your table. How will you paint it. I like painting in the sense that it doesn't really overuse any part of my body. I know you understand. 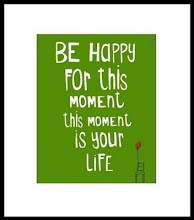 You can do it at your own pace. 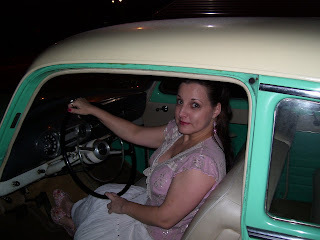 The car is awesome....wonder how much an air conditioner would cost installed? I know you would look cool in it, however, might want some a/c living in the South. Vroooooom baby! LOL Love those wheels~oh, that car is SOOOOO YOU! I love all your garage sale treasures ! 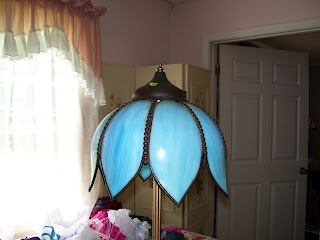 The lamp is a gorgeous color ~ just like that car ! 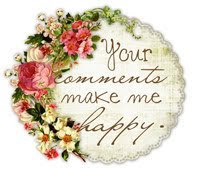 I look forward to seeing your completed projects ~ that little table is so cute ! 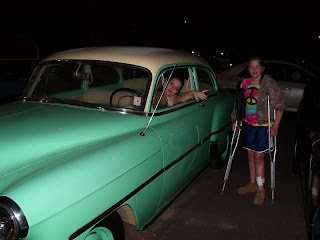 You are adorable in that car! And what a steal you got on that candleabra and lamp...so beautiful! I remember my Dad having a car like that. Well that color anyway..lol You found some great bargains. Love the silver piece. Great finds!! I love going to garage sales too but its getting a bit chilly here now and I can't get up so early. On the way to visit family recently, i bought a little silver dish which my mumsays is a jam dish. You have inspired me to egt it out of the bag and polish it.I also bought a dressing table and cupboard from a garage sale which I haven't given a second thought to.I want to paint them white but I am finding lack of time a real issue for me. Ill post them soon as I can. You naughty girl !! get outta that car!! You have guts, go girl!! Definately, pink roses, love it!! I'd show hubby but he's still in bed this sunday morning and then he might want to take off later and look at the 'Effy's"(Old 50's Fords) at Tenterfield. he is going to HAVE ONE one day for sure , he says. Ok whatever! !